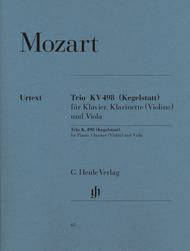 Trio E Flat Major KV498 (Kegelstatt-trio) fur Klavier, Larinette (Violine) und Viola - Revised Edition (Revised Edition Piano, Clarinet (Violin) and Viola Score and Parts). Composed by Wolfgang Amadeus Mozart (1756-1791). Edited by Ernst Herttrich. For Clarinet, Piano, Viola. Henle Music Folios. Urtext edition. Softcover. 52 pages. G. Henle #HN63. Published by G. Henle (HL.51480063).Was this skilfully composed work really written during a game of ninepins? The legend persists, although there is no reliable source. At all events the unusual instrumentation is of note: having a clarinet instead of the violin was by all means usual in piano trios; but in addition Mozart replaced the cello with a viola, his favourite instrument by his own admission. As a result the viola has a much stronger part than the cello usually has. Our single edition of this buoyant work was taken from the volume containing the complete piano trios (51480247) which was revised for the Mozart Year 2006 and includes the latest scholarly findings.